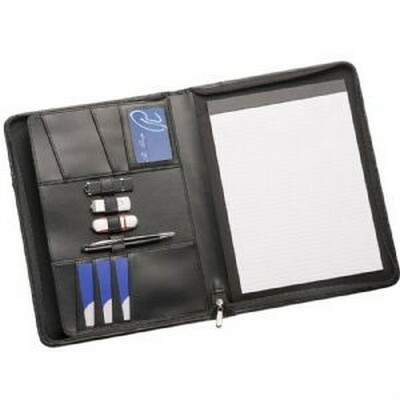 Description: Manufactured from full grain leather this zippered compendium has a unique pen holder on the front cover. Internally is has loops to hold pens and USB flashdrives with pockets for business and credit cards. Supplied with a standard pad this compendium is also able to hold a spiral pad. Features: Check out our Tablet Compatibility chart to see which tablets fit in the product. ?Fits Tablet Holder Item 9118. Will accommodate a side entry pad. Packaging: Wrapped in white tissue paper. Presented in a 2 part black gift box. Packaging Size: 280mm(w) x 360mm(h) x 50mm(d) Colour: Black Material: Full grain leather Product Size: 350mm(h) x 260mm(w) x 30mm(d) Freight details : 10 per carton, 13kgs, 50.5 x 30 x 39.5cms; Decoration Type(s): Colour Print / Deboss / Debossed Foil / Foil Stamp / Full Colour Print Decoration Area: Screen - 150mm(h) x 150mm(w). Price includes : 1 Colour 1 Position Print. Setup is included.